Do you ever feel like sometimes you just need a bit of help getting organised? (or "getting your **** together" is what I actually meant and wanted to say! )....I do too! I am a very organised person at work (some would say 'bossy'...I say 'assertive'!) but when it comes to my own personal life and keeping up with my To Do List, sometimes it all gets a bit overwhelming! I am terrible at keeping in contact with friends and family, I have just started to get the hang of budgeting (I've owned a house for the last three years, I really should have had budgeting down to a fine art ages ago! ), I always forget deadlines on car/home insurance renewals, I still haven't registered myself with my local GP and dentist surgeries (which are at the top of my road! ), instead travelling the 8 miles to my old ones near my parents house...the list goes on. Sometimes, I wish I could hire a life-coach for a week, to come in, wave their magic wand and sort it all out for me....or am I getting confused with a Fairy Godmother?? Either way, action has to be taken and I need to GET.ORGANISED. Well, there's something to be said for the 1st day of a new month. That feeling when you realise how quickly the year is running away from you and there's still so much more you need to accomplish. How gorgeous is this planner?! 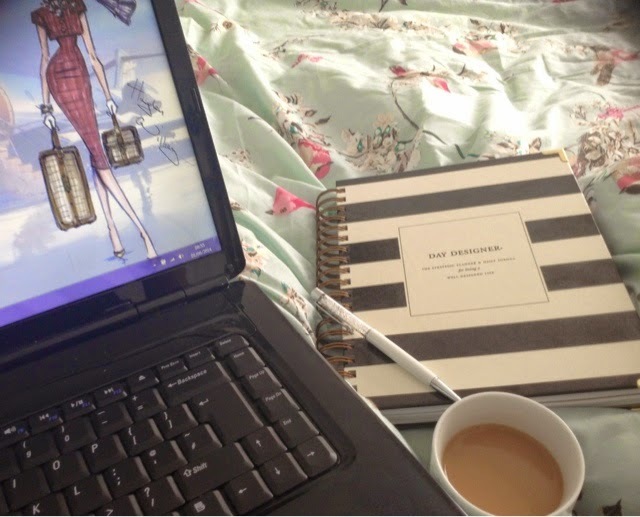 I don't know if I have mentioned before on this blog, but I love monochrome stripes. I think it's so stylish and chic and I admit, this is one of the main reasons I was attracted to this organiser. It also comes in Gold and White stripes, which looked lovely too, but I preferred the Black and White. Day Designer. The Strategic Planner & Daily Agenda for Living a Well-Designed Life. This planner is the big guns. It means "Lets do business, Let's do this, Let's GO!" It has a satisfying hard back cover which is beautifully spiral bound. The inside of the front and back covers are a bright fuchsia pink which contrasts lovely with the monochrome. It is a real joy turning through the pages. It feels luxurious. It feels like quality. The paper is luxe weight with a fine texture and each month is divided by thick card which is gold edged, that double up as a space for notes. It has a space for goals, expenses, meal planning, To do lists, don't forget's, daily gratitudes....and each day comes with a motivational, inspiring quote. It's not what you start in life, It's what you finish. - Katharine Hepburn. How very apt! This is a life planner not just a day planner - I think this is the Life-coach and Fairy Godmother that I've been looking for all in one! This planner runs from Aug 2014 to Jul 2015 and I believe the next edition to be printed will run from Jan to Dec. Priced at $60 (Approx £35 plus shipping and custom charges) this planner is an investment. It was purchased from creator Whitney English's online shop at Etsy (here) and it is shipped from the US. I suppose the price is no different if you are used to purchasing quality planners/organisers like an A5 Filofax eg. It arrives in beautiful packaging, which for me is all part of the ritual of getting something like this in the post - it feels special! From the US of A!....I'm like a kid at Christmas when I get deliveries in the post!! Tied in a beautiful velveteen pink ribbon which has a special meaning which is explained to you on the care card included. The next job for me is to actually use this and make the most of it. I am determined however, (not least because of how much it cost!) but also because I need to finally take charge and instill some structure and organisation in my life.....and with a lovely little blog to run also, it has to be done! Take care everyone and Happy 1st August!